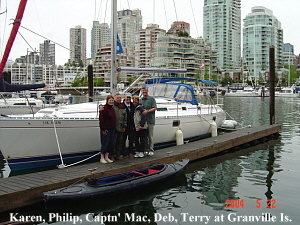 As an instructor of the Boating Course offered by the Sunshine Coast Power & Sail Squadron, I arranged a cruise-and-learn for four students who wanted practical experience cruising in coastal waters. 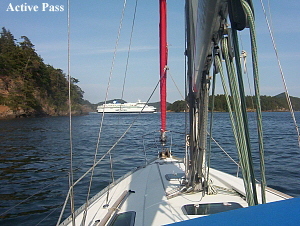 During our week, we explored the Gulf Islands and transited most of the passes in this popular cruising area. The Canadian Tide and Current Tables provides depths of water and speeds of current at various times and locations on the B.C. coast. Such information is essential to safe boating in these waters. Yet, many boaters find the Tables too complicated and therefore rely on “eyeball” estimates of depth and current. Not a good idea! Many marine-insurance claims each year result from boaters over-estimating depth of water or under-estimating speed of current. After provisioning and receiving an orientation to our 12-metre Beneteau from Ian, the base manager at Sunsail Charters in Vancouver, we departed into First Narrows heading west towards Lion’s Gate Bridge. It was time for the students’ first test. The current table showed a flood of 2 knots. With our boat cruising at 6 knots into this current, I asked students to estimate our speed over the ground. No one needed a calculator to answer 4 knots, confirmed by our GPS. By moving into the back eddies on the south side of the Narrows, we added a knot to our ground speed. Considering right-of-way rules more important than speed, we crossed back over to the proper side of the channel. Our afternoon was spent practicing man-overboard drills and various points of sail on our way to Bowen Island. Although mid-May is considered “shoulder season,” our preferred destination of Snug Cove was already full so we anchored in adjacent Mannion Bay. In light winds the next day, we motor-sailed across Georgia Strait to Nanaimo Harbour, a good jumping-off point for transiting 60-metre-wide Dodd Narrows. The next morning, we reviewed the tide and current tables and translated these into daily graphs which give a picture of the tide and current at any given time. Graphs are especially important when transiting a pass in which currents can overpower a cruising sailboat. Dodd Narrows, for example, can have currents of 9 knots. I began our discussion with a question: “How can we determine what time the current is running no more than 2 knots? We call this our “window of opportunity” for safe passage.” I consider 2 knots an acceptable maximum for beginning boaters. Our Current Graph (see below) for Dodd Narrows showed slack at 0930 and our window to be between 0830 and 1030. I mentioned a few other considerations when going through passes: The “red-right-return” rule applies in the direction of flood currents as shown on the chart. Currents in tidal channels change direction as often as four times a day. Ideally, proceed with the current which adds to ground speed and also gives right-of-way over on-coming traffic, since they have more maneuverability. To minimize turbulence, stay mid-channel unless opposing traffic requires keeping on the right side. Also, mid-channel current is usually deeper and faster which increases forward speed when going with the flow. Conversely, if safe to do so, stay off to the side in shallower and slower water when headed against the flow. In a sailboat, always use the engine and if there is sufficient wind, have the mainsail up in the event of engine failure. Never use a headsail … erratic winds may shift toward the bow. Furling a headsail in the middle of a pass is not conducive to keeping a sharp lookout. Having said that, during the week I occasionally encouraged the students to practice sailing in passes to better appreciate the effect of current. With full sails and a substantial bow wave, you get the impression of moving forward in an opposing current until you notice a tree on shore maintaining its relative position for 10 minutes! Motor sailing can make the difference in those situations. Finally, be extra cautious when winds and currents are in opposition. Such conditions can create potentially hazardous standing waves, much higher than when wind and current are from the same direction. 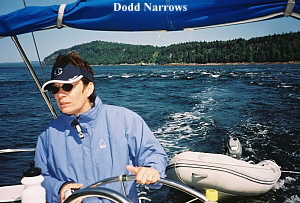 By the time we entered Dodd Narrows, current was flooding (against us) at 2 knots and several logs swirled in the eddies, providing a slalom course for Karen, our wide-eyed helm’s person. That evening we stern-tied in cozy Conover Cove, a fine place to walk along forested trails that extend the entire length of Wallace Island. The next day, we transited S-shaped Sansum Narrows during slack current and docked at Genoa Bay. Restaurants were closed so we fired up the BBQ and planned activities for the next day . We would transit Active Pass (in both directions) and for the evening tie off to a buoy in nearby Montague Harbour. Active Pass is appropriately named — we encountered four ferries during our hour-long visit. Midway into the pass, I simulated an “engine failure” and had the crew sail out of harm’s way. One student described our visit to this pass as the “tour de force” of the cruise; another said it definitely reduced the intimidation factor of this well-used passage. Our plan the next day was to visit Porlier Pass but two hours of beachcombing put us outside our window of opportunity. The turbulence we observed from the entrance gave students an appreciation for the importance of developing current graphs. We proceeded to Gabriola Passage on our way to Silva Bay at Gabriola Island. With help from a 2-knot flood, we attempted to sail through this pass into brisk easterlies and some troublesome standing waves. After several tacks and little forward progress, we furled the jib and motored through the turbulent waters. The next day, brisk south-easterlies gave us an exhilarating ride across the Strait to our anchorage in False Creek. Four-hour parking at Granville Island allowed time for dinner and some serious boat gawking. In calm conditions the next morning, we motored out around Stanley Park and into Vancouver Harbour, returning through First Narrows into a 4-knot ebb. After surviving five passes, students were getting quite comfortable with current and questioned whether 4 knots, rather than 2, should be the acceptable maximum. I reminded them of the possibility of engine failure, an oncoming freighter, erratic winds, potentially dangerous standing waves, and their futile attempt to sail through Gabriola Passage with a 2-knot boost from the current. Refer to the Current Table for the passage you plan to transit, find today’s date and circle it. On a sheet of graph paper, write “Knots” on the vertical axis and “Hours” on the horizontal axis. To determine the numbers on your vertical axis, note the “Maximum” speed of current today, say it’s 7.5 knots. Starting halfway up the vertical axis, write 0 knots. Then write the numbers + 1, +2, etc. up to 8 knots and -1, -2, etc. down to 8 knots. Plus numbers are floods; minus numbers are ebbs. It’s helpful to draw a horizontal line across the graph at zero (slack). Mark hours along the horizontal axis to cover the time in question for today (add one hour during Daylight Savings Time). Here’s the fun part: place a dot across from the Maximums (both flood and ebb) at the indicated Times during the day and join the dots. The resulting current line should pass through your “slack line” very near the time of “Turn” indicated in the Table. Now determine an acceptable maximum current, say it’s 2 knots. Put dots on the current line across from these values on the vertical axis, both flood and ebb. 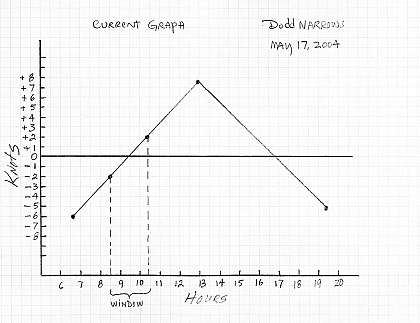 Drop two lines directly down from these dots to the horizontal axis for a “window of opportunity” — the period of time when current is no more than 2 knots in either direction. Although current graphs can be made more precise by calculating sine waves, the above approach is adequate for practical purposes.